A company close to Azerbaijani President Ilham Aliyev and his family likely walked off with more than US$ 1 billion in a takeover of his country’s stake in Azercell Telecom, the largest mobile operator in the country. The process was aided by a subsidiary of TeliaSonera, the Swedish-Finnish telecom giant, which acted against its own interest to allow the deal to happen. TeliaSonera, which owns a majority share of Azercell, facilitated and financed the takeover and agreed to dilute its own ownership stake and turn down dividends in order to placate the government of Azerbaijan. In exchange, Azercell would receive all required regulatory approvals and licenses necessary to operate in Azerbaijan, according to internal documents from an early version of the deal. A former financial investigator who reviewed the findings called it possibly the largest bribery in Swedish history. Reporters from the Organized Crime and Corruption Reporting Project (OCCRP), Swedish Television’s program “Uppdrag Granskning” (“Mission Investigate”) and the Swedish News Agency TT spent three months examining hundreds of pages of business records, annual reports and internal documents related to the deal. Swiss Radio and Television (SRF) and the Turkish daily Hurriyet contributed to the reporting. The analysis uncovered a scheme to transfer the states shares of the profitable mobile carrier into the hands of a “local partner” with numerous links to the ruling Aliyev family. In addition, TeliaSonera and its partners down played and obscured what was really going on in its documents and its public statements at the time were often misleading. Einar Hackner, an experienced auditor and professor emeritus in business administration at Mid Sweden Universitywho reviewed the reporters’ findings, believes the government assets have likely been stolen. TeliaSonera’s business practices have come under withering fire in recent years after SVT working with OCCRP and later TT revealed bribes allegedly paid to a member of the ruling family of Uzbekistan. The company’s new CEO, Johan Dennelind, was hired after the scandals and has vowed to clean up its business practices. Dennelind said that the transactions raise a number of questions, including who TeliaSonera’s local partner in Azerbaijan was. He said the company has made available all materials to prosecutors to review. “We have some countries, including Azerbaijan, where we have a situation where we do not know the identity of our partner,” Dennelind said. He said the company has tried for more than 18 months to determine who their local partners are but without success although he admitted it was likely someone close to power. 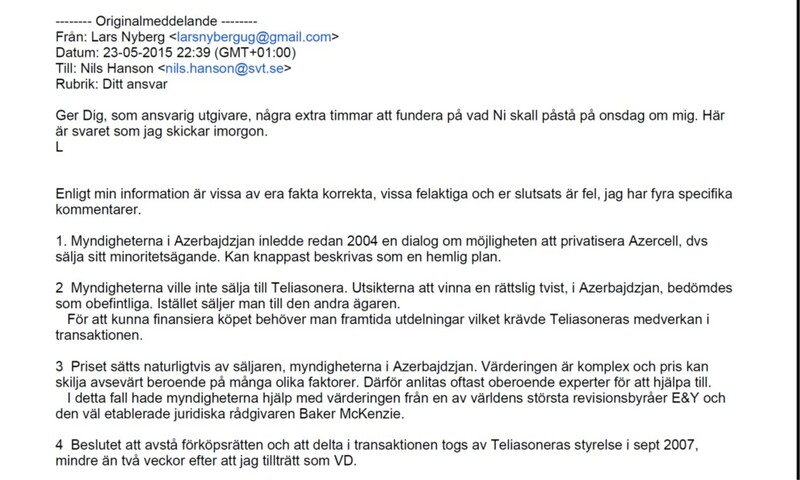 Lars Nyberg, TeliaSonera’s CEO from 2007 to 2013 when he resigned after the Uzbekistan affair became public, refused an interview with SVT but in email exchanges called the conclusions “wrong”. Azerbaijani journalist Khadija Ismayilova, who was arrested December 2014 by the regime and later freed in May 2016 on appeal, stated: "They threw me in jail to prevent me from telling the truth to the people. They are hiding the real shareholders of Azercell. The main shareholders are hidden behind offshore companies." Azerbaijan, an oil-rich country of nearly 10 million people on the Caspian Sea, has one of the highest mobile penetration rates among the former Soviet republics. After oil, the telecommunication industry is the largest industrial sector in Azerbaijan, and a major contributor to its economy. It is hugely profitable, paying hundreds of millions of dollars in dividends to its shareholders. Azercell was established in January 1996 as a joint venture between the Azerbaijani government and Turkcell, a leading mobile phone operator of Turkey. The Azerbaijani government owned 51 percent of the new mobile carrier. Faced with the difficulties of operating in a country considered among the most corrupt in the world, Turkcell, later that year brought in a new partner that was viewed favorably by the government: the Istanbul-based Cenay Insaat (Cenay Construction), which is part of a group of related companies known as the Cenay Group. The Cenay Group, which would play an important role in the deals that favored the companies close to the Aliyevs, is owned by the Guldamla family. At the time, the family had already established a good relationship with Azerbaijan’s first president Heydar Aliyev, the father of the current president Ilham Aliyev. The relationship continued after Heydar Aliyev’s death in 2003, and Cenay officials would sometimes appear at special occasions with the new president. Their financial success is largely due to their various businesses in Azerbaijan, which include fiber optics, oil and natural gas. They are heavily involved in the strategically important Trans-Anatolian gas pipeline project promoted by Azerbaijan. Together they formed an Istanbul-based holding company called Azertel and Turkcell moved its ownership share of Azercell into this new company. Azertel, through a recapitalization, later increased its stake in Azercell to 64.3 percent while the government’s stake decreased to 35.7 percent. In 2000, Turkcell merged most of its international holdings, including Azertel, with assets from the Finnish telecom operator Sonera into a Dutch-based company called Fintur Holdings. Turkcell received a minority stake in the new company. Sonera merged two years later with the Swedish operator Telia to become TeliaSonera. Through its majority in Fintur, TeliaSonera gained management control over Azercell. From the beginning Azercell profits and taxes were a major contributor to Azerbaijan’s state budget and by 2004 were also helping TeliaSonera’s bottom line. But in 2008, when the company started to really earn big profits, the state’s share was quietly shifted to companies linked to the family of the President Aliyev. At the end of 2003, things were looking promising for Azercell. After seven years on the market it had just reached the 1 million subscriber mark and was selected as the “Best Company of the Year” by the Consulting & Business magazine and “Charity Benefactor of the Year” by the Azerbaijani non-governmental organization Alliance For Children’s Rights. Shareholders were pleased. The company was the second biggest taxpayer after SOCAR, the state oil company, and had just distributed profits of US$ 31.5 million – at the time the highest dividend ever paid in Azerbaijan. The future looked even brighter in early 2004 when Erdal Durukan, the CEO of TeliaSonera’s Dutch holding company, met with Farhad Aliyev, then the Minister of Economic Development of Azerbaijan. The minister told Durukan of a plan to privatize the government shares in Azercell by June 2004, and asked for a proposal from them. According to a shareholders agreement, if the government wanted to privatize its share in Azercell, it was required to first offer its shares to TeliaSonera before offering them to anyone else. Durukan presented a privatization plan to his board of directors in April of 2004. TeliaSonera planned to increase its indirect ownership in Azercell from 51 to 75 percent, giving it full management control of the company. While the government of Azerbaijan valued the company at between US$ 400 and 550 million, TeliaSonera’s valuation was higher – between US$ 600 and 700 million. The board gave a go ahead to start negotiations with the government and its partner the Cenay Insaat. The maximum cost TeliaSonera was willing to pay was US$ 200 million, which was the government’s estimate of the value of the company but lower than TeliaSonera’s estimate. If it succeeded, TeliaSonera would no longer need to ask the government for approval on decisions and major investment projects. The board wanted to move quickly to privatize because the longer they waited, the more expensive Azercell was likely to be. Business was booming and handset sales growth was steep. The value of the company was increasing just as steeply. TeliaSonera put a full team of legal, financial and tax advisors to work on negotiating the privatization. They hoped to close the deal by the end of 2004. But six months later, in September 2004, a new player entered the game. With no explanation, the government of Azerbaijan informed TeliaSonera that the Swedish-Finnish telecom could not privatize Azercell by itself. Instead, Cenay Insaat and a new government-approved local partner would privatize the share. TeliaSonera would have to waive its right to buy the government shares and agree to finance Cenay Insaat and the new local partner with a US$ 100 million loan. Cenay Insaat and the local partner would repay their debt through the dividend stream the new partners would earn through its increased ownership of the lucrative Azercell. At no point did the executives explain the sudden shift of strategy or even reveal the true identity of the local partner. In exchange, the mysterious local partner agreed to certain conditions that were documented in a confidential agreement dated Dec. 14, 2004. In that agreement, TeliaSonera that the new partner must guarantee it would get all necessary licenses and regulatory approvals and that the government would pass laws liberalizing the telecom industry. Such a sweeping commitment could only be delivered by the government itself or a highly placed government official. The agreement mirrors one signed by TeliaSonera in the Uzbekistan bribery scandal. TeliaSonera wanted to maintain corporate control over Azercell’s holding company, and appoint all board members. The local partner would have the right to nominate one board observer. But the local partner wanted more management control, something TeliaSonera was unwilling to concede. TeliaSonera fought the deal and tried to negotiate better terms. The pushback by TeliaSonera had immediate repercussions. The government shelved the proposed sale of the state stake. It gave no reason for the change in plans. Azercell suddenly found itself under pressure from state regulatory bodies, and tax authorities who began conducting an extensive audit of its operations. The situation is not unusual for companies operating within corrupt regimes. Exerting pressure on foreign companies is a typical tactic used by to force them to agree to kickbacks. Authorities in Uzbekistan repeatedly used that same method to force the sale of telecom companies to companies close to Gulnara Karimova, the daughter of its president. The scheme took a new twist in the spring of 2005, when a new and equally murky local partner put privatization back on the agenda. Azercell’s shares would now to be shifted to a company that was designed to look a lot like TeliaSonera’s long-time Turkish partner, Cenay Insaat, but which was in reality very different. On April 26, 2005, two of Cenay Insaat’s founders established a new company with a very similar name: Cenay Iletisim (Cenay Communications). They asked TeliaSonera, as required by their partnership agreement, to approve a transfer of half of Cenay Insaat’s shares to the new company (equal to about 6.5 percent of Azercell) and to give the new company the same rights that Cenay Insaat enjoyed. This included what are known as pre-emptive rights which gave the new company the right to buy the shares of any of their other partners should those partners want to sell their stake. The rights are important because it ensures that a shareholder’s proportion of the voting and dividend rights are not diluted and shares are not sold to undesirable partners. On Sept. 23, 2005, when TeliaSonera’s subsidiary approved the transfer of shares, TeliaSonera was informed Cenay Iletisim was controlled by the Cenay Group. Less than a month later, Cenay sold its interest in Cenay Iletisim to two Panamanian shell companies that had been newly incorporated: one five months earlier, and one just a month previously. Cenay Iletisim’s ownership structure exactly matches that used most frequently by the Aliyev family businesses during this period. The two companies involved were registered in Panama, where the Aliyevs had registered most of the family’s offshore companies. They were formed by the same Panamanian registration agent, Morgan y Morgan, normally used by the family. Cenay Iletisim was represented by long-time Aliyev family proxy Olivier Mestelan, a Swiss lawyer who was the signatory of other companies set up by the first family. The director of the company is Ahmet Cemhan Bilge, a Turk whose construction company is the main contractor for Aliyev and his daughters. This shift of ownership to murky offshore shell companies was never mentioned in the official records and regulatory filings of TeliaSonera, Turkcell or Fintur and remained undetected for years. Turkcell in its annual reports continued to represent its partner as the Cenay Insaat. TeliaSonera only mentioned there were unnamed minority shareholders. Again, it was a deal that made no commercial sense. The new Panamanian controlled partners bought Cenay Iletisim (and thus 6.5 percent of Azercell) for just US$ 6.5 million - a substantial discount to market value. The Cenay Iletisim share was worth between US$ 26 and 45.5 million based on a 2004 valuation of Azercell’s value as being between US$ 400 to 700 million. The value was actually likely to be much higher taking into account Azercell’s rapid growth in 2005. At the end of 2005, Azercell had 1.7 million subscribers and US$ 240 million in sales. When a reporter from OCCRP asked Cenay Group’s Ugur Uzpeder why it would give up half its share for so little, he would only say “It is better to sell for us. In mid-December 2005, TeliaSonera was given the same choice by the government that it had fought a year earlier – either they approved a deal whereby Cenay Iletisim, would take over the government’s stake in Azercell, or the government would find someone else. The price was set by the government at US$ 180 million. But a privatization directly to Cenay Iletisim was not possible. Azercell’s holding company Azertel had the rights to first refusal. The government legally had to privatize its share to them. Azertel as the holding company had to come up with US$ 180 million to buy the government’s share. Under the shareholder’s agreement, each of its shareholders had the right to participate in any recapitalizations on a pro rata basis so they could maintain their percentage of ownership. For the privatization to work like the government wanted it to, TeliaSonera and Cenay Insaat would have to refuse their rights to participate in the recapitalization. That meant TeliaSonera would have to willfully choose to not take advantage of the privatization to increase their stake in Azercell. Cenay Iletisim, the company close to the President, would gain a much bigger slice of the ultimate pie. TeliaSonera had no other choice. The deal was approved. After the privatization Cenay Iletisim would indirectly own 42 percent of Azercell (up from 6.5 percent), TeliaSonera 51 percent (down from 80 percent) and Cenay Insaat 6.5 percent. To add insult to injury, TeliaSonera and Turkcell were expected to loan Cenay Iletisim the money it needed to buy the shares. The government award of new licenses soon followed. Although Azercell was the largest mobile provider in Azerbaijan and for several years had been the telecommunications industry leader, it lagged behind the industry in getting an 1800 MHz license. Soon after the deal was approved, the government of Azerbaijan announced that Azercell would be granted an 1800 GSM license. While the deal was approved at the end of 2005, it took two more years to finalize. On Feb. 12, 2008, TeliaSonera announced that Azertel had reached an agreement to purchase the Azerbaijan government’s 35.7 percent stake in Azercell. The deal closed April 1, 2008. While the deal was a bad one for TeliaSonera and its partners, it was and an even bigger disaster for the people of Azerbaijan. First, the purchase price set by the government was ludicrously low. In April 2008 when the government’s stake in Azercell was finally sold to Azertel, Azercell was worth US$ 2.2 billion. That means that the state’s interest – according to TeliaSonera itself – was worth US$ 785 million, and not the meager US$ 180 million the government sold it for. The dividends alone that would be paid on the stake over three years were worth US$ 184. million which covered the purchase price. And the deal was structured so that those anticipated dividends would be used to pay for the transaction. But that’s not all they lost. Internal documents show that people of Azerbaijan did not even receive all of the US$ 180 million. At the government’s request, at least half of that amount was paid through a three party arrangement with holders of government vouchers. The history of such government vouchers is an ugly one. In the 1990s, Azerbaijan like many post-Soviet countries, sought to privatize certain state-owned enterprises. As part of that program, every citizen received four voucher coupons which were often scooped up by unscrupulous or sometimes criminal traders who paid naïve citizens a fraction of their worth. According to a US bribery trial in federal court in New York, the last known whereabouts of two-thirds of the Azerbaijani vouchers were in 28 shell companies owned by Azerbaijani government officials including possibly the Aliyevs. It is likely most of the vouchers used in the Azercell deal came from these offshore companies. The transaction was a win-win deal for those closely connected to the Azerbaijani ruling elite. TeliaSonera likely paid the voucher owners, whose identities are cloaked behind the offshore shell companies, full face price for vouchers that were likely worthless without the government’s agreement they could be used. The government and the telecommunications companies refuse to release any names. TeliaSonera not only had to agree to the deal and to finance it, they had to give Cenay Iletisim a ‘put’ option, meaning Cenay Iletisim had the right to sell their 42 percent stake back to TeliaSonera at a fair value at some future date. Again, this mirrors similar telecom deals in Uzbekistan. By doing so, TeliaSonera committed its subsidiary to a US$ 873 million liability to Cenay Iletisim – potentially a US$ 1 billion transfer of wealth when including dividends from TeliaSonera to the company close to the president’s family. When this all happened, Azercell initially expected to receive permission to use the newest technology, at the time a 3G license. One of its competitors, which is owned by the President’s two daughters and also owned through a Panamanian offshore using the same proxies, had a 3G license. Despite Cenay Iletisim’s alleged clout, no license was forthcoming for Azercell. Three-years later, a license finally appeared in late 2011, and like previous licensing deals, it came in the wake of another hidden reshuffling of Azertel’s ownership. On Nov. 4, 2011, TeliaSonera, Cenay Insaat and Cenay Iletisim gathered for their annual general meeting to approve the results of the fiscal year ending Sept. 30, 2011. Although the results were approved, the Board declined to distribute dividends for unknown reasons. A month later on Dec. 2, 2011, the Board again met and did an about face on distributing dividends. But the shareholder that ultimately received 6.5 percent of the dividends was not Cenay Insaat, but a previously unknown shell company, FA Invest Malta, which has been incorporated just five weeks earlier. FA Invest was represented by Hamzayev Rashad Firidunoglu. Coincidentally, one of the president’s personal security guards in the Special State Guard Service has the same name. His names appears on a list of Guard Service employees who received special awards “For the service to motherland” from Aliyev in August 2010. A few weeks after FA Invest’s entry and Azertel’s distribution of those delayed dividends, Azercell finally received its long-awaited 3G license, and shortly thereafter, a 4G license. The story of what happened to Azerbaijan’s largest telecom company is a complex tale, made more confusing by deliberate and repeated attempts to obscure what was transpiring. To untangle it, reporters for OCCRP/SVT/TT presented the findings to two experts, Hackner, professor emeritus business administration and Hammar, retired police officer and one of Sweden’s most experienced investigators regarding financial crime. Both concluded that the deal was not only grossly unethical, appeared to be designed to transfer government wealth into the hands of a company closely linked to the Aliyev family, but possibly criminal. Hackner, an experienced auditor, said that everyone who participated had to know this new company was in fact controlled by someone very powerful. “I find it impossible that TeliaSonera does not know. The worst thing to do is to sweep something under the carpet and hope it does not show up,” said Hackner. Contributing reporting by Lejla Camdzic (OCCRP), Boris Kartheuser (freelance Switzerland), Sylke Gruhnwald (SRF) Julian Schmidli (SRF), Lovisa Moller (Factwise), Sofia Hultqvist (Factwise), and Durna Safarova (freelance, Azerbaijan), and Tolga Tanis (Hurriyet). The story is based on the original reporting by Khadija Ismayilova.